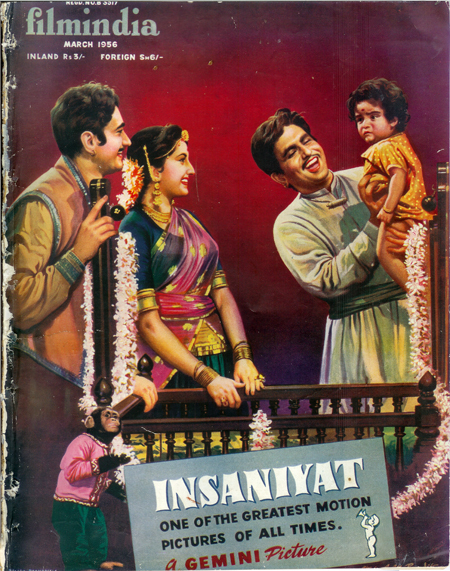 Plus, the movie Insaniyat seems to have been on the cover of this magazine for about a year! Too bad the film didn’t quite live up to all that hype. 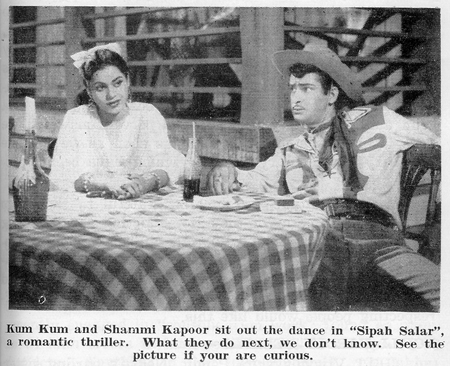 Here’s another shot of Cowboy Shammi in Sipah Salar, a movie I really really want to see although I fear it doesn’t exist any more. I love Kum Kum too. And finally, Nigar Sultana channeling Carmen Miranda. Gorgeous! Posted on February 13, 2012 at 12:21 pm in Baburao Patel's Poisonous Pen, Hindi film history, Hindi movies	| RSS feed You can skip to the end and leave a reply. Love the Nigar Sultana pic too. Loved her in Magroor. It is wonderful to see these rare pics, memsaab. Thanks a lot. She’s got shells instead of fruit, but still—what a lovely headdress and she is just beautiful. @Memsaab – This is lovely. Thanks for bringing it to us. Madhubala looks heavenly. Nargis’ eyes seem so much like Sanjay Dutt’s. I want to see ‘Mastani’ …… in addition to Sipah salar, of course. Thanks for sharing Memsaabji!!! Nothing to beat Filmindia! Lovely, lovely. The hand-painted posters of the film are so well done. Thank you – loved those! And I do so want to see Sipah Salar. I have seen the film Sipahsalaar(which roughly means commander in chief or Senapati).Since I find that many people are curious about this film,based on my notes I give herewith a short synopsis of the film.if you are unable to see the film,atleast here is some info about it. It was an Eagle films presentation,produced by F.C.Mehra and directed by Mohd.Hussain who also wrote its story,s/play and dialogues as well.Music was by Iqbal with lyrics from Faruk kaizer. The evil Vazir of Bharatpur(Randhir) ousts the good king(Kamal Mehra) and captures the throne.The good but helpless king escapes to another country.However his loyal,trustworthy and brave Sipahsalaar(S.Nazir) goes underground and continues guerilla fighting with the Vazir. The king wants to send a plan to recapture his kingdom to his Sipahsalaar.For this purpose he chooses a Captain(Shammi Kapoor).He is ready to undertake this dangerous mission.Disguised as a Truck Driver,the Captain starts his journey,but is recognised and stopped by a major(Shyam kumar) at the border.At this time a mysterious,beautiful patriot girl(Nadira) saves him and both escape in the jungle. hereafter the film depicts many adventures,jungle scenes and moments of love between SK and nadira,including some songs. They finally reach sipahsalaar,etc etc. Arunkumarji – You sure are a discovery for all of us. You have given so many details of a movie many of us haven’t even heard of. With your help, we could pen biographies of so many stars gone by. Thank you for the info.. The jodi of Nadia and Shammi Kapoor however makes one mind boggle :D. And where did Kumkum come in (seen in the picture above)? and that cowboy outfit ? Shammi appears to have beat Feroz Khan and Akshay Kumar to the draw by several years! 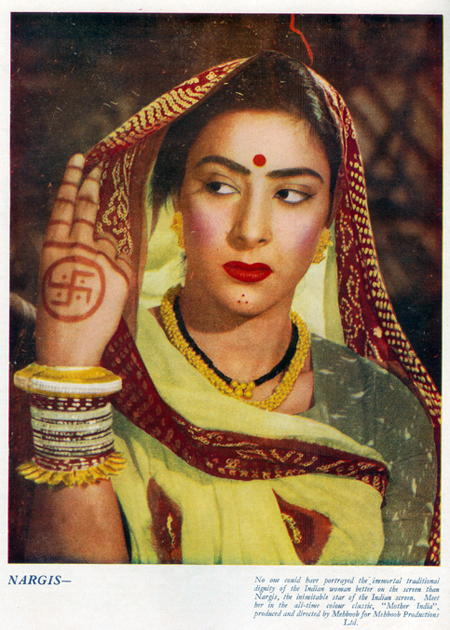 Loved the old pics – especially Nargis. I love it when Nigar curls up one side of her lips. Nadira and Shammi were awesome together in Professor Pyarelal…but the young sizzling versions of them would be great to see! As far as I remember,kumkum was planted by the intercepting Major(Shyamkumar) to engage Shammi kapoor till his truck was searched for his true identity,at the state border.Shammi Kapoor had that get up while driving the truck,throughout the long journey(perhaps he was hoping that no one will recognise him in it). Thank you once again for the information Arunkumarji (Please call me ‘Salim’ as I am more like your younger brother). Your mention of ‘notes’ recalled my teenager days when I too used to keep ‘reviews of films I saw. Do you have your own blog? I am sure you could tell us a lot. I do not have any blog. I have kept notes on almost every film that I saw since my first film.I did not keep notes on well known films,though. I regularly write on atulsongaday.me,where I have already written about 270 old,less known and obscure films,starting with the first Talkie Aalam Ara-1931.I have also written about 200 notes on movie backgrounds,old songs,singers,directors,MDs,lyricists,production houses and allied topics. I also write on blogs like cineplot,Harveypam,kamalp.,dustedoff,songsofyore,memsaab,chitrapatsangeet etc. As far as writing the suffix ‘ji’,it is a must for me. What Shashi said…thanks Arunji! Did you see it in a theater, or is there some hope that a digital copy of it exists somewhere? I saw it in a Theatre,after it was released in 1956. I think the DVD may be available in some online store,who specialise in old films. But be careful to check the cast before buying as there was another film by the same name’Sipahsalar’,produced in 1936 featuring singing star Khurshid,Yusuf,jani babu,Balabhai,Effendi etc. The chances of getting the older film are,ofcourse,almost nil. OMG, how old were you in 1956 to see it back then? That’s amazing! And hahaha, about mistakenly getting a 1936 movies. You could probably count in one hand all the 1936 Hindi movies available today. I was in my late teens in 1956 and medical college by 1960. I’ve not been able to find any mention of a vcd, let alone a dvd…but hope lives on :) If I did get the 1936 one by mistake I certainly wouldn’t mind! 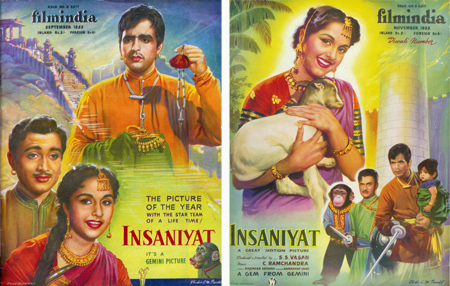 I could barely recognise Dev Anand from his profile in the “Insaaniyat” poster. Pity he didn’t co-star with Dilip Kumar again. Nargis picture seems to be coloured later. 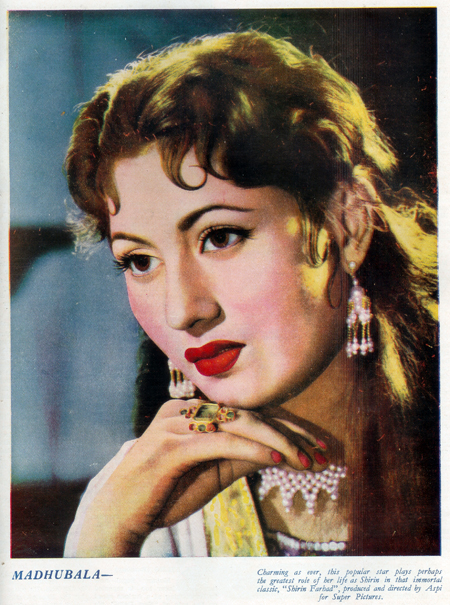 The Red isn’t the natural read one gets to see….Madhubala as usual is divine. That Dev Anand? Would never have guessed. More coming as I have been too distracted and busy to watch any movies! Great historical treasures you’re sharing, thanks! So Insaaniyat came out not long before Naya Daur? That one is one of my favourite films, so happy it didn’t have “I really AM a Dev” Anand in it, his presence is a blight on any film. And the Madhubala poster reminded me again how much a Panjabi friend looks like a ( “dusky”) version of her. Shammi as a cowboy, priceless! Naya Daur is awesome, Insaniyat not so much :) Your friend who looks like Madhubala is a lucky girl indeed! Isn’t it interesting going through old magazines,? Dad had quite a collection of old Film Indias and Filmfares, I remember rushing up to his room every time we visited my grandparents in Nagpur just to eagerly flip through these magazines. Oooh, the thought of that makes my mouth water :) It is such fun to look through these. Hey memsaab, Do you know from which movie this Helen photo is from? I need to know immediately. Thanks in advance. plz tell me who is the son of madhubala.? As far as I know, Madhubala had no children. Neither biography of her that I own mentions one. It’s from the Sept 1962 issue of Filmfare magazine. I think its from Kabli Khan or Shikari though I am not 100% sure. But thanks anyway ! Guess what debonair Dev Anand has reverentially thought and said about genius Baburao Patel? ‘Now,the ever-debonaire Dev Anand, the sigh and heart-throb of millions of day-dreaming women, took over the microphone. For a good two minutes, he could not speak due to the continuous applause. “Mr. Baburao Patel is one of the most outstanding men of our Times. I deem it an honor to speak on him! My acquaintance with him dates back to my College days. That was in Lahore, now in Pakistan. 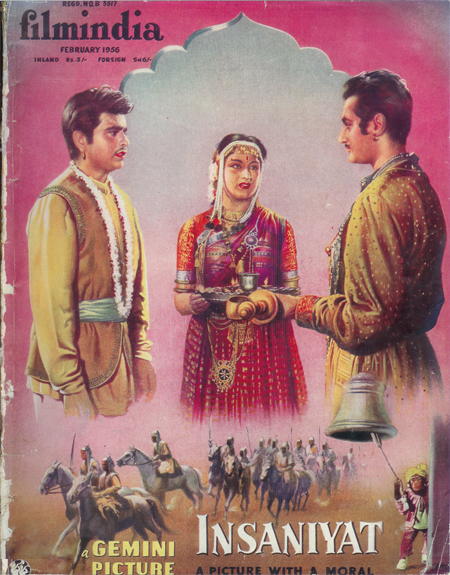 all the University boys in the campus used to carry copies of ‘filmindia’ along with their text books. In fact,the Indian Movie Industry then,also meant Baburao Patel ! A great movie critic, whose writings in his Journal spelt Magic amongst readers. and have a look at this Magician, who meant the Indian Movie Industry to me. He made and un-made stars. He established or destroyed a film, with just a stroke of his pen! That much Power he wielded,then. My first close contact with him, in fact, came when I made the film, “The Guide”. and so,naturally,I was very nervous before it’s release. And,fortunately, I went to Baburao Patel to seek his Blessings before its release. He not only blessed me,but he also had a Pooja performed for me. I was touched.I was blessed ! God-fearing Baburao came to the forefront, instead of the image of a harsh-hearted,ruthless bully which the Movie Industry held of him. When his ‘filmindia’ turned into ‘Mother India’,Baburao was on the threshold of a new experience. He turned to politics.He was fighting an Election. seeking their confidence,seeking their votes. I met him then again,just to lend him my moral support as a fellow human being. And,I was a witness to another aspect of Baburao. Of Baburao,the leader of mankind. He radiated confidence and warmth,and a sense of leadership amongst his fellow beings. So,here is a man with so many facets to his personality. He is a man of tremendous Learning and tremendous Knowledge,tremendous Depth. A great Patriot,a great Nationalist,a great Genius! His pen is as sharp as a sword. A great Doctor who heals as much with his words, as with his medicines. He has written books on Medicine. A great astrologer whose Scientific study of the Stars is unlimited. A combination of a Man and a Sage! whenever I am a little depressed,I can easily go to Baburao. It is an honour to speak on Baburao. It is an honour to honour Baburao ! The Nation should have honoured him long ago! ‘This short,direct and dynamic speech electrified the audience. and his unique choice of the right words. Editor of ‘filmindia’ and ‘Mother India’ ——– the most exciting magazine in the World! the Platinum Jubilee Number of ‘Mother India’ published in December 1979.